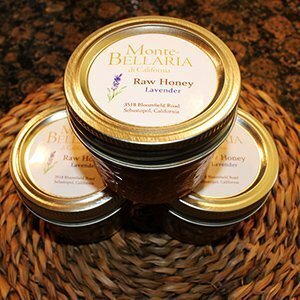 If you’ve ever tried local, raw honey you’ve probably noticed that various honeys can take on amazingly different tastes. The key reason is that the flowering plants from which forager bees are collecting nectar and pollen have distinct taste profiles. When bees forage primarily on one type of plant, the honey is called “monofloral” and produces a more consistent taste profile than when bees find many different flowering plants in their immediate area (up to five miles from the hive). Some of the plants that are most attractive to bees and produce high quality honey are the flowers of blackberries, fruit and citrus trees, herbs (like rosemary, borage and sage), flowering bushes, clover and other wild flowers and, in the case of Monte-Bellaria, lavender. Some nectars are very mild and produce honey that tastes, well, like “plain ol’ honey.” Our lavender flowers have rich, exceptional nectar characteristics that yield extremely fragrant and floral-tasting honey. The taste of the honey also changes over the course of the blooming season. Early lavender honey, for example, has a distinctly lavender bouquet. Late lavender honey, on the other hand, still tastes very floral, but not as clearly identifiable as lavender. One of the biggest commercial uses of U.S. honey bees is during the pollination season California’s Central Valley. Each year, millions and millions of bees are trucked from around the country primarily to help pollinate the almond trees. One thing that most people don’t know is that the honey that is produced as a by-product of their almond foraging tastes awful. Some have said that it tastes like turpentine or very bitter and astringent. Luckily the bees themselves don’t seem to mind it and it has the same nutritional value for them so, in this case, they get to keep all of the product of their hard work. Interestingly enough, a tree that also employs bees for pollinating in Southern California is the avocado. But unlike the almonds, the avocado produces a sumptuous, buttery tasting honey. Another common flowering tree in California (and Australia) is the eucalyptus; it too produces a very favorable, high-quality honey. An odd source of good-flavored honey is poison oak. 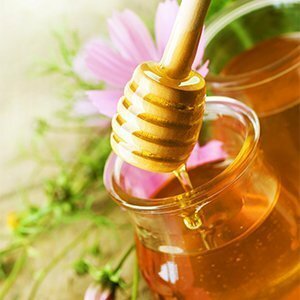 Thankfully, none of the rash-inducing toxins carry into the honey itself, which is said to have a mild, nutty flavor. The reason why this particular honey is in high demand is that some people claim that eating honey made from this plant can reduce the susceptibility to breakouts—in the same way eating local honey is said to reduce allergic symptoms.